Q1 2019 saw Odfjell Drilling take delivery of the the Moss CS 60E-type semisubmersible Deepsea Nordkapp. Winterised throughout, the unit is designed for operations in deepwater offshore environments. 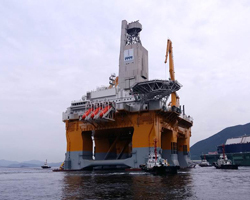 It was built by Samsung Heavy Industries in South Korea and will commence work in Q2 this year, fulfilling a contract with AkerBP on the Norwegian Continental Shelf. The unit can tackle varying water depths, depending on the method of station-keeping selected. For example, when operating in offshore depths of between 300-2,000m, it will typically utilise its DP3-rated Kongsberg dynamic positioning (DP) system, supported by six Rolls-Royce thrusters rated 5,500kW apiece. However, Deepsea Nordkapp is also equipped with a 10-point mooring system, featuring 84mm chain, for operations in depths spanning 100-500m, Odfjell Drilling says. Deck loads also vary depending on current vessel function. When drilling, the crew can rely on a deck load capacity of 7,050tonnes, which decreases to 4,830tonnes when the vessel is in transit. Deepsea Nordkapp is powered by six Wärtsilä 16V32 main engines. Each engine is rated 7,400kW, and this set-up enables a transit speed of approximately 8knots. Deck cranes include three knuckle boom models, manufactured by National Oilwell Varco (NOV): two rated 100tonnes, the other 30tonnes. The vessel also features: two BOP cranes, rated 275tonnes apiece; two riser-handling cranes, rated 27.5tonnes each; and two Xmas tree cranes, rated 75tonnes each. A 570tonne BOP trolley and 150tonne Xmas tree trolley also feature on the rig. A helideck, meanwhile, permits the landing and take-off of S-61, S-92 and EH-01 helicopters. NOV also supplied the unit’s four mud pumps, which are rated 7,500psi apiece. The semisub has been constructed with abundant storage capacities, so as to reduce its dependence on regular supplies. For instance, it can store up to 4,800m³ of fuel, 1,980m³ of drill water, 1,180m³ of potable water, 840m³ of base oil and 800m³ of brine. There is also adequate tankage for 2,980m³ of liquid mud and, in terms of bulk cargo, the unit can store up to 322m³ of mud and 322m³ of cement. The vessel has been classed by DNV GL for worldwide operations and carries that society’s Drill (N) notation. It has also been developed to meet the requirements of the Norwegian Maritime Directorate (NMD), the Petroleum Safety Authority (PSA) and the UK Health and Safety Executive (HSE).